Remember back in elementary school in the 2000's, when all the otaku kids would pick factions based on their favourite trading card game/anime franchise? Of course the biggest names were Pokémon, Digimon and Yu-Gi-Oh!, but I was one of the few westerners to choose a fourth option in Duel Masters. The franchise has a pretty rocky history: in 1996, the original Yu-Gi-Oh! manga was launched, which featured protagonist Yami Yugi playing a number of different games at first. One game, known in-universe as Magic & Wizards, laid the foundation of what would later become the now-iconic Yu-Gi-Oh! trading card game, which was released in 1999 and was also known as Duel Monsters, as was the 2000 anime. As the name suggests, Magic & Wizards was intended as a reference to the O.G TCG: Magic: The Gathering, and it wasn't long before Wizards of the Coast, the owners of Magic, took notice of Yu-Gi-Oh! 's success and wanted to replicate it with their own manga based on the already established TCG. 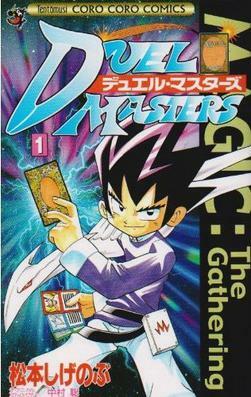 In 1999, Shigenobu Matsumoto released a manga based on characters playing a fictionalised version of the game, known as Duel Masters. One small problem: Wizards of the Coast wanted a manga set in the world of Magic as opposed to a manga about people playing the game. Regardless, Duel Masters was a hit in Japan, and in 2002 there was an anime series and a TCG based on it created by Wizards, which was essentially a simplified version of Magic, e.g. players still used mana to summon creatures and cast spell but had five shields instead of a number of life points like the original game (and Yu-Gi-Oh). In 2004, Hasbro (who also owned Wizards of the Coast) brought the anime to the west, featuring a dub from Plastic Cow studios that made the tone of the series much more lighthearted than the original version, with a lot more jokes, pop culture references and a few jabs at that one other show about a spiky haired kid playing a card game where the monsters on the cards came to life. While it probably didn't reach the levels of the other TCG/anime franchises it did achieve a sizable fanbase outside of Japan, earning an official western-made comic spinoff, video games and even an exclusive second season that wasn't based on the manga. But this success didn't last long. Hasbro wanted a cheaper company to handle the dub with every season, which didn't just piss off the fans but even people behind the show. In 2006 the dubbed version of the anime came to an end, and so did the TCG in the west. Meanwhile in Japan, Duel Masters is still surprisingly popular, spawning a number of spinoff movies, games, manga and anime series that are still being released to this day alongside the TCG. Hell, the next series of the anime debuts in April and there's even a teaser video for it, although it looks pretty different to the series I loved when I was around 10 (Note that the video I linked to isn't available outside of Japan so get your VPNs ready). Do you remember this underrated but awesome series from about 15 years ago? Did you watch the anime, collect the cards or play the PS2 or GBA games? Do you, like me, wish it didn't have to fall into obscurity? Drop your thoughts below!